WelCom April 2018: It was with some reluctance Palmerston North’s Justice Peace and Development Commission accepted the resignation of their dedicated fellow member Dion Martin. He has served the diocese for 13 years with energy and faithfulness. The Commission felt it was fitting to recognise Dion’s immeasurable contributions and dedication to social justice causes. 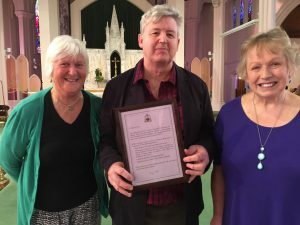 On Sunday 11 March, they presented him with a certificate of appreciation at the Cathedral of the Holy Spirit. organising the successful diocesan Social Justice Week community meetings, including inviting politicians to respond to community-member panels about social issues such as poverty, deprivation, affordable housing, homelessness, mental health, refugees, immigration, inequality and the working poor. Dion says it has been a privilege to pray, plan and work on many projects with the Commission over the years and alongside many inspirational and spiritual leaders.